Gautam Kothari, DO grew up in northern New Jersey where his family still resides. He was accepted into an accelerated 7 year medical program directly from high school. He completed his undergraduate studies in 3 years at the New York Institute of Technology and then went on for his medical schooling at the New York College of Osteopathic Medicine. 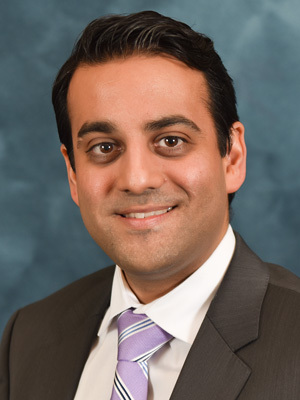 After completing his residency training in Physical Medicine and Rehabilitation at Nassau University Medical Center, where he served as chief resident in his final year, Dr. Kothari went on to do additional fellowship training in Interventional Spine Care and Sports Medicine at Orthopedic and Spine Specialists in York, PA under Michael Furman, M.D., an international figure in the field. Prior to joining MBO, Dr. Kothari was a Clinical Instructor for the Department of PM&R at Thomas Jefferson University in Philadelphia, PA. In addition to his clinical duties, he was involved with training medical students and residents. He was nominated for title of Associate Clinical Professor prior to his departure. Dr. Kothari is a published author and has a variety of publications, including most recently a “Pocket Handbook of Spinal Injections” which is used as a quick reference for doctors in training. Dr. Kothari has a special interest in spinal disorders and musculoskeletal injuries and also performs a variety of fluoroscopically guided procedures including epidural steroid injections, nerve blocks, joint injections as well as radiofrequency ablation. In his spare time, he enjoys staying active and spending time with friends and family. "Dr Kothari was very good. I felt like he was really going to take care of my pain. He was friendly and professional. Ashwini Deshpande was so good. She said she was going to make me well and she did. She was friendly and professional. She explained things very well. It was a vet good experience." "I have nothing but the highest regard for Ashwini and Lisa in the physical therapy department. They are skilled, knowledgeable, professional and kind. I will definitely go back to see them if I need physical therapy in the future. They are the best!"